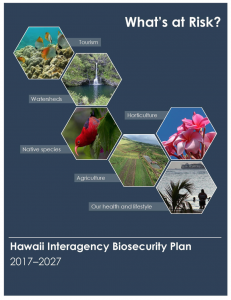 The State of Hawai‘i, in a broad coalition of stakeholders led by the Department of Agriculture and the Department of Land and Natural Resources, has adopted the State’s first interagency and comprehensive biosecurity plan to protect Hawai‘i’s agriculture, environment, economy and health. 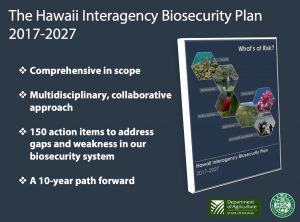 The scope of the Hawai‘i Interagency Biosecurity Plan addresses three biosecurity areas including pre-border (for example, agreements on handling and treatment of products before they enter the state), border (for example, inspection authorities and technologies), and post-border (for example, tools and capacity for response after invasive species have become established). The benefit of a comprehensive interagency plan is that it facilitates actions and policies across a wide range of agencies and partners. The plan includes roughly 150 action items assigned to various agencies and stakeholders, with specific details on how and when to best implement each action. In January 2017, the HISC adopted Resolution 17-1 endorsing the Hawaii Interagency Biosecurity Plan and committing to its implementation. 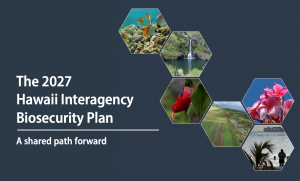 The Interagency Biosecurity Plan is the state’s guiding document for biosecurity improvements over the coming decade. The HISC is responsible for tracking implementation of the Plan across agencies, and will report progress annually.